It is about ten minutes from Kitera by car. There is the farmer's restaurant, 'Mikan Batake' in Akizuno Garten. Local mothers make slow food lunch buffet with local fresh vegetables, and it is very popular. It is also a reasonable price: An adult for 950 yen. Akizuno Garten is completely equipped with facilities for staying. 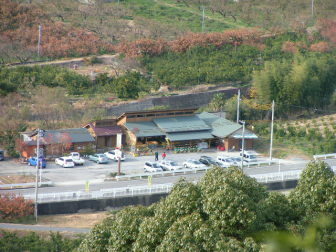 You can use it as accommodation for green tourism, the entrance to Kumano Kodo, or for Nanaki Shirahama Onsen. Autumn in Akizuno is the harvest season. There are a lot of fruits such as mandarin oranges, persimmons, and figs, different kinds of mushrooms, edible wild plants, and vegetables. The clerks give you a bright smiles. Through the center of Kamiakizu and go up about 1.5 kilometers toward to Ryujin-mura you’ll see the wooden building close by Aizu-gawa River. 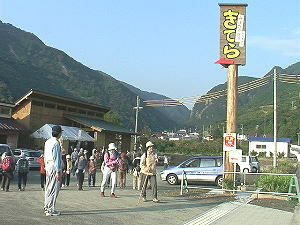 It is ‘Kitera,’ the farmer’s market in Kamiakizu. ‘Kitera’ is a regional dialect, and it means please come here, so residents named it by wishing many people to visit here. Kitera was opened 500 meters far from the current place in May, 1999. The fall of that year, Nanki Kumano Experience Exhibition was held in Kinan Area, and voice of wanting farmer’s market raised in Kamiakizu. 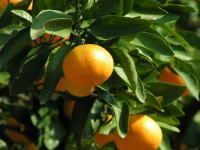 Many kinds of citrus fruits are harvested throughout a year, mainly mandarin oranges, in this area. There are also plums and persimmons, vegetables, and flowers here. So opening famer’s market was one way of vitalizing local community. “Decide the price of own produce and let customers buy it directly. Not good production hardly sells these days. I wanted customers to buy fresh and safe production with cheap price. Also, there are farmer’s markets everywhere in vigorous regions.” said Kasamatsu Yasumitsu, the former representative director. For the community vitalization, it is a reality that without economic, it won’t last long. At first, voluntary 31 people, not only famers but also other occupations, invested 3 million and 100 thousand yen. They made the system that anybody who lives in the area can sell products with paying a 15 percent commission on sales. The price of the product was decided by producer. Women lived in the area was hired as salesclerks on a part-time basis. The store was an approximately 33 square meters prefabricated house, so it got full with even a few customers. Light wasn’t enough bright in the store, and it wasn’t a great building. Everything was groped and handmade. It was a first time for famers in Kamiakizu to put the price on the productions by own, sell them, and manage the store. Like many other districts, famers had sold their crops through Japan Agricultural Corporative Association. 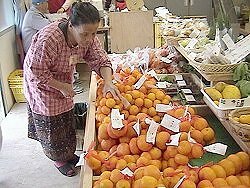 The research about sales and sales methods of produce by Kamiakizu master planning committee shows that 60.3% unshu mikan was sold through JA. 45.4% of other kinds of Mikan, and 60.3% of Ume are same. There were few percent of individual shipping or selling directly to the customers. So opening Kitera proposed another way of selling produce. We started, so we must work out a solution. It was ‘Kitera Set,’ assorted box of special produce in Kamiakizu, which saved the store from bankrupt. 3,000yen for one set brought the customers. The end of the fiscal year the settlement of accounts came out. The sales of the first year became about 10 million yen. Concerns of famers were eliminated. If you do nothing you get nothing, but if you make a move, you’ll gain something. People regained the confidence. Mr. Kasamatsu looked back that time and said, ‘Kitera set rang the bell, and customers increased. More customers means more sales. I could feel the awareness of people started to change.’ The first famer’s shop in the area spread the wavelets either better or worse. Kitera set is a moneymaker, and is sold three times a year in spring, summer, and winter. We get order by letters or fax, make stuffed box with produce in the area (mainly mikan in the season), and send it to the customers. By being reported on the media and word of mouth, sales increased exponentially. ‘The confidence’ changed into ‘the conviction’. Sales of 2003 was over 50 million yen. 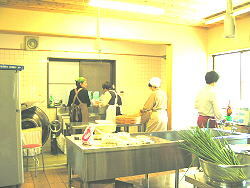 In April, 2004, Kitera moved to a new place since it was registered “Ki-no-kuni business” in Wakayama prefecture. The new store was made of Kisyu Trees and the space got twice bigger, so the kinds of goods on the store increased. Vegetables and fruits in season are brought. There are also a tray landscape and folk craft on the store. The number of shipping people doubled from 70 to 150 in April, 2004, and it increased to 270 in April, 2010. Elderly people bring what they make, and it becomes one of the reasons for living. More than 70 percent of customers in Kitera lives in Tanabe, and the other 30 percent is from outside of Tanabe. There are more cars from other prefectures which are coming for sightseeing of Kinan area these days. Some are from a distant place. Interacting with consumers let producers notice the value of things which they couldn’t see. “These things can be marketable.” Recognizing anew makes productions on the store more kinds and fertilized. Nowadays there are 200 kinds of productions mainly fruits, vegetables, flowers, and pickles in a year. Almost all are local produce and production. ‘Local production for local consumption.’ The store opens 7 days a week, from 9 a.m. to 4:30 p.m. Many people visit the store and it gets busy on the weekends. Processing factory was built in 2004, fulfilling the foothold and expanding operation. In 2004, the processing factory and the storehouse were built in the site of Kitera. The processing factory was made of woods, and it cost about 15 million yen. It used an institution of helping to settle down on the mountain village of Wakayama prefecture. The achievements of the farmer’s market continued to be on a steady growth path. Producers of shipping and the sales has been consistently increasing. There became 68 investors in January, 2004 and a half of them isn’t a farmer. However, Mr. Kasamatsu and fellows doesn’t think that the business continues to grow. They are cautious about reaching a peak someday. Having own factory was a pending problem. A new facility is going to be a foothold of making processed products of Ume and Mikan. 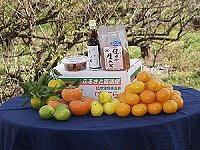 Developing new products like fresh juice using many kinds of Mikan is under study now. Also, it is important to provide good products that can withstand the consumers’ stern eyes. How can we offer the productions more fresh and in the best condition to the costumers? There are some cases that the quality differs depending on producers. Actually, there was a scene that a costumer checked the name of producer and decided which one to buy. How to respond the customers’ needs is always the proposition of direct shop. Mr. Kasamatsu said, ‘we’re going to aim substantial advance, promote local productions for local consumption, and promote safety of food.’ He tries to make school lunch use local fruits and vegetables for local elementary school and junior high school. ‘Ikka club.’ ‘Ikka’ (means a family in Japanese,) may remind Yakuza, ‘〇〇Ikka,’ however, it has meanings of ‘inter-family association’ and ‘companions.’ So ‘ikka club’ means close comrades like relatives. In other words, to organize a fan club of Kamiakizu to support by putting Kitera on the center and the letter was the invitation of joining it. Yufuin, Oita prefecture. It is well known as an advanced area of revitalizing the community, and people proceeded revitalization by conserving regional resources of Yufuin Onsen and scenery of farming villages. Consequently, the town used to be called ‘a countrified lonely village’ changed into a popular sightseeing area which four million people visit in a year. In Yufuin, there is a network called ‘Relative Club’ which connects with urban area. ‘Events such as film festival and music festival can’t be hold only by the locals. We need to borrow the wisdom of people who love Yufuin, and work together to make the community.’ Those are the purpose of making the association. ‘Ikka Club’ of Kamiakizu was born with the same conception. Joining the club needs ten thousand yen. There is a message to stabilize the management of Kitera and make it a foothold of interchange of urban area and firming village. A member of the club becomes ‘mind shareholder.’ 21 people joined the members. Kitera set and correspondence are sent once in a year, and it connects the farmers of Kinan firming village and consumers in the city. An exchanging event was also held. It aimed to learn about each other and discuss about future of Kamiakizu. In Kamikizu, opening home page on the internet is prospered. Not only Akizuno-jyuku but also young farmers put up their own websites. Dispatch of information using IT by Akizuno Media group, special programs and commercial on the radio, newspaper, pamphlets, and interregional exchange. Akizuno Farmers’ Market Kitera becomes involved in revitalizing the region of Kamiakizu by expanding the network. ‘Ikka club’ aims to be the core of the movement. Linking primary, secondly, and tertiary industry becomes 6th industrialization. Originally, by using mikan, a special product of this district, mainly local women was making jelly, sherbet, jam, and ponzu. 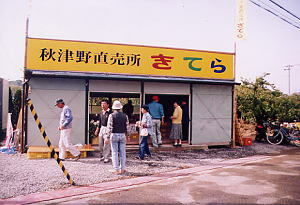 Before building the juice factory, we had brought mikan to the factory in Kumamoto-city, Mie, but it wasn’t last long. Mikan with bad shapes or having scars on the surface was considered lack marketability even though the taste doesn’t change much. We used to deliver those produce to a big juice factory through JA (Japan Agricultural Cooperatives,) but because of the cost of collecting and delivering, farmer didn’t get any benefit. Against that background, a topic of making juice factory and processing food facility came up. The funds of building juice factory was collected the investments the same way as Kitera, and gathered thirty members times 5 hundred thousand yen (total is fifteen million yen.) The place is next to Kitera and about an area of 10 tsubo. We brought the machine in and built processing food factory and a warehouse. We introduced the juice extractor made in America, and sold fresh juice every day in Kitera. We got good reputation there, and gained the confidence for commercialization. The juice factory got a permit from public health center to use effectively as a processing factory. At first, it took an hour to squeeze 100 kg of mikan by hand, and six to seven hours to squeeze 600 to 700 kg of mikan, so we started work at three or four o’clock in the morning. By the cooperation from a new resident who used to work at processed food company, we had done capital investment, and could grow in efficiency of making juice and quality of juice. Started in fall of 2004, we used 21 t of mikan for the first year, and we could make only 12 t of juice. It’s about ten thousand bottles of 1 litter juice. We used Unsyu mikan, Pon-kan, Dekopon, Kiyomi Orange, Navel Orange, and Valencia Orange. 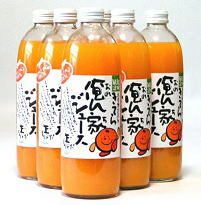 There were 31 t of mikan for the juice in 2007, 42 t in 2008, and 50 to 60 t in 2008. 40% to 50% of those becomes juice. Stable supply depends on the quantity of mikan in a year. When we have enough amount of mikan, we can prepare extra, but in the season of less mikan, we cannot make juice. Also, there is limited farmers who bring mikan for juice. Ensure the material becomes the critical proposition. Thanks to the cultivating various kinds of mikan, the material of juice is plenty, and a theme which now confronts us is how to deliver fresh produce to the consumer with keeping it fresh and delicious. Also, we need to think about making Kitera corporatization or not. Those struggles and problems are linked to establish Farmer’s Restaurant Mikanbatake later. In 2006, under the idea of ‘without investments to the region, it won’t improve,’ we make Kitera a join-stock corporation, and it became a major turning point of revitalizing the region. The main purpose of making join-stock corporation is to make sure the locus of responsibility since the annual sales hit one hundred million yen and the handling amount of money increased. In addition, there are more merits that it is possible to make judgment quickly on the management, enter into a contract smoothly, and change the boarding members smoothly by getting approval of shareholders. To change into joint-stock corporation wasn’t easy. With this experiences, when the green tourism management company was established in Kamiakizu, we invited shareholders from the first and incorporated a firm, and Akizuno Garten has started. You can buy Oren-chi Juce with special price of members after you login or sign up free membership of Kitera. Five minutes from famer's market 'Kitera,' there is Akizuno Garten, a facility connecting urban and local agriculture community, formed with reusing the local elementary school. It is a popular facility and about 70,000 people visit here in a year. 'Valencia Batake', the sweets workshop using citrus fruits harvested in the area, is very popular. Why don't you stop by and try making sweets for mementos of visiting the country of Akizuno? Copyright(C) 2006-2017 Kiteraga.com All Rights Reserved.